As most members of the USSS know by now, the long awaited Encyclopedia of United States Stamps and Stamp Collecting is set to make its debut at 2PM on Saturday, May 27, the opening day of Washington 2006, at the Washington, D.C. Convention Center. We hope that many of our members will be able to join us for this historic event. We thought it would be helpful to “tell the story” behind the Encyclopedia and how it came to be over the past five years. There are so many people who have worked to make it possible, and so many anecdotes along the way. 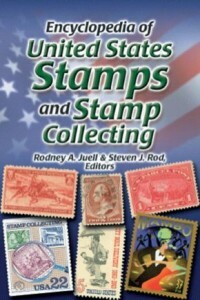 Shortly after Rod Juell, of Illinois, was appointed chairman of the United States Stamp Society’s recruiting committee in 2000, he sought to develop tools to support the Society’s recruiting efforts. He felt strongly that the USSS had to show potential new members tangible benefits for belonging the premiere Society for United States stamp collectors. The first one developed was a Glossary of Terms, which appeared in print and electronic form. This was Rod’s effort to clarify the language of United States stamp collecting by putting all of the relevant terms and definitions in one place for easy access. After this was completed, Rod wanted something more – perhaps, he said, “a brochure that would introduce the hobby of U.S. collecting to new USSS members.” This “more” turned out to be the Encyclopedia of United States Stamps and Stamp Collecting, the ultimate fruit of Rod’s desire to have an easy to use, hands-on reference about U.S. collecting. The Board of Governors of the USSS initially sought one person to write “an introductory book” on U.S. stamp collecting. As the Board discussed Rod’s recommendation for a brochure everyone quickly realized that something more than a brochure was needed! Rod developed a preliminary table of contents for a book, and a single author was sought to write it. Steven J. Rod, of New Jersey, was recruited, based on all of the years he had written “introductory columns” in Linn’s Stamp News every week. The USSS asked him to replicate the easy style of Linn’s “Refresher Course” in this new book. Steven designed a format that would be followed for each chapter, and actually wrote several chapters, which were published in The United States Specialist. However, it quickly became apparent that neither Steven, nor anyone else, could write, by himself, the book that was evolving in the Society’s vision. As the book progressed, two very able assistants came to the fore. Lynn Batdorf, of Maryland, an experienced writer, served as an amazing technical advisor, and Doug D’Avino, of New Jersey, became an amazingly helpful consultant. Batdorf, D’Avino, Juell and Rod spent the entire three days and nights of Indypex 2005 in a virtual non-stop review of the manuscript. To meet the USSS’s mission of promoting the collecting of United States stamps throughout the general community, there was a desire to arrange for mass distribution of “the book.” In order to accomplish this we realized we needed to partner with a recognized publishing house that could bring the book to the non-philatelic community. Without a publishing partner, the book would be viewed by the general population as little more than a “house organ.” Rod developed a relationship with Leonard Flachman of Kirk House Publishers in Minneapolis. This amazing, passionate and committed man has been invaluable in teaching the editors about the book publishing industry and the many things we needed to do to help promote the book effectively. Should our book achieve success in the general community, something our hobby sorely needs, that success will be due in large measure to Leonard’s efforts on our behalf. One of the earliest signs of Leonard’s passion for this project was when he challenged the editors regarding the title of the book. Its title for many, many months was the Encyclopedia of United States Stamps. After Leonard began to receive chapter drafts from the editors, and reviewed the Table of Contents, he strongly suggested that we properly title this effort the Encyclopedia of United States Stamps and Stamp Collecting. Thanks, Leonard! Kirk House has arranged for the book to be carried by Amazon.com and Barnes & Noble. It will also be featured on the Kirk House website, The book will not be available anywhere until Saturday, May 27 when it debuts at Washington 2006. Beginning in June it will be available through booksellers everywhere and directly from the USSS with a discounted price for members of $25, postpaid. From wanting a simple tool to recruit new members to the Society, Membership Chair Rod Juell’s dream has led to the Encyclopedia of United States Stamps and Stamp Collecting. Dozens of USSS members and some friends of the USSS worked to make this 730-page dream come true. There were 37 contributors who crafted the core content of the 62 chapters. For the most part, each was already a recognized collector of that chapter’s material. There were numerous other folks who took the time to read the chapter in their specialty area and wrote thoughtful letters of suggestions for additions, deletions and corrections. Others supplied images, answered editors’ questions or helped in other ways. USSS Chairman, Roger Brody, has been wonderfully supportive both of the Encyclopedia of United States Stamps and Stamp Collecting and of the editors’ desire to price this unprecedented philatelic book as reasonably as possible in order to achieve the widest possible distribution. The USSS mounted a “benefactors Campaign,” in which members were asked to contribute $100 or more to a Benefactors Fund. We were able to raise in excess of $30,000 with this successful campaign. This subsidy amount enabled the full-color, hard-bound, gold-stamped, and dust-jacketed book to be priced at only $30 retail, even though our publisher, Leonard Flachman, and many others, said the book could easily have been priced at $55 or more! The 300 benefactors, listed in the last Appendix of the Encyclopedia, have helped us to fulfill the core mission of the USSS – to promote U.S. stamp collecting. The USSS owes a debt of gratitude to them for their optimism and support of this project.